Greece, which is already seeing riots at any hint of fiscal austerity, just isn’t the kind of nation which is likely to decide that five years of wage cuts in a painful and deflationary recession is a price worth paying to stay current on the national debt. ….Nouriel, of course, takes that kind of thinking to its logical conclusion, and kicked off the panel by announcing that it was just in time: “in a few days,” he said, “there might not be a eurozone for us to discuss.” There’s no way that Greece can implement the 10% spending cut it needs to do in order to stop its debt spiralling out of control at current interest rates — and even if it did, the economic effects would be disastrous. ….Of course, this being Nouriel, it goes downhill from there: if Greece is worse than Argentina, he says, then Spain is worse than Greece. Its housing bubble and bust has left the banking sector much weaker than Greece’s; its unemployment situation, especially with the under-30 crowd, is much worse than Greece’s; and the cost of any Spain bailout would be so much more enormous than the cost of a Greek bailout as to be almost unthinkable….There’s no good news here. The least bad course of action for Greece, in Nouriel’s eyes, is some kind of coercive yet orderly debt restructuring, which keeps the face value of the debt unchanged but which reduces coupons and pushes out maturities. And an exit from the euro. One of the key takeaways from Reinhart and Rogoff’s This Time is Different is that, historically, countries aren’t forced into default, they choose to default. That is, they decide that the austerity measures it would take to pay down their debt simply aren’t politically feasible, so they make the decision to default rather than pay off their loans. 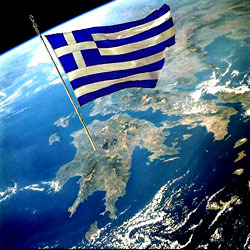 That’s pretty much where Greece is. That’s bad enough on its own, but because Greece is stuck in the eurozone and can’t devalue its currency or inflate away its debt, it’s even worse for them. It’s hard to see any non-disastrous ending for this. Financial markets may be hugely profitable right now, but they’re still skittish as hell and completely unwilling to accept significant risk. So even if the IMF and the EU end up rescuing Greece, I’m not sure that will save them for even a few months, let alone a few years. And once the contagion spreads to Portugal and Spain, as it’s almost certain to, what then? As Roubini says, it might effectively mean the end of the eurozone. Or maybe not. I suppose that muddling through sometimes works better than anyone believes it will. But I wouldn’t bet on it this time, and more to the point, neither will the world’s financial markets. In fact, they’re already betting against it pretty heavily, and they’re only going to amp up the pressure as time goes by. The best case now is probably an immediate default followed by a bank rescue, and then a prayer that no other country needs the same treatment. Beyond that, it’s anyone’s guess. Pretty soon, we’re likely to find out if some systemically important bank is overexposed to Greek debt, or to the euro, or to some derivative thereof. Buckle up.